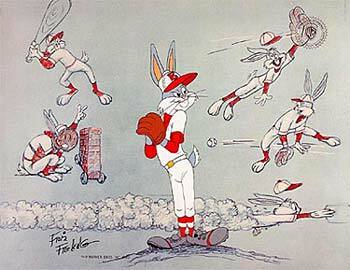 Hand-signed by Warner Bros. legend Friz Freleng, this is one of the most famous, and rarest, Looney Tunes tributes to baseball. Bugs Bunny faces the Gashouse Gorillas alone, playing every position. This fine art Hand Painted Limited Edition Cel is based on an original drawing by Warner Bros. studio legend Friz Freleng. The background recreates additional drawings by Freleng.